The crude price started to increase after mid-2016 and so the offshore oil & gas industry started to stabilize. The price crossed USD 60 per barrel mark in November 2017. In 2017, the rig contacting activity and utilization also showed improvements. The major demand is for higher specification jack-up along with the sixth and seventh generation semisubmersibles and drillships for harsh environments. Opening of coastal water in the United States for exploration and production, and recovery of Brazilian oil & gas industry, along with increasing crude oil price, are expected to increase the tendering activity for offshore rigs. The deepwater drilling market is expected to rebound in the near future due to increased activity in the Golden Triangle – Gulf of Mexico, Brazil, and West Africa. Chevron’s Ballymore and Shell’s giant Whale discovery in the Gulf of Mexico represents the sign of regional deepwater revival after a long time, without any major discovery. In March 2017, Ensco PLC, an offshore drilling contractor, said that they had witnessed a 200% increase in rig years, tendered for jack-up year over year. The discovery of Egypt’s mammoth offshore natural gas field “Zohr” is expected to increase the demand for mobile offshore drilling unit. Several large offshore drilling projects countries such as Mozambique and Nigeria are further expected to drive the market. In 2018, the rig tendering activity is expected to increase in response to positive outlook for offshore drilling activity. In Brazil, companies such as Chevron, Total, Shell, and others are in talks with drilling contractors for mobile offshore drilling units for drilling Brazil’s pre-salt and post-salt play. Around 14 deepwater projects are expected to come by 2020 in the country. Brazilian state-owned company Petrobras is expected to replace contracts expiring in 2018 and next year, as well as new rig requirements from late 2019. The US government has opened 98% of its coastal waters for exploration. As a result, the market is expected to witness increase in rig tendering activity in the forecast period. 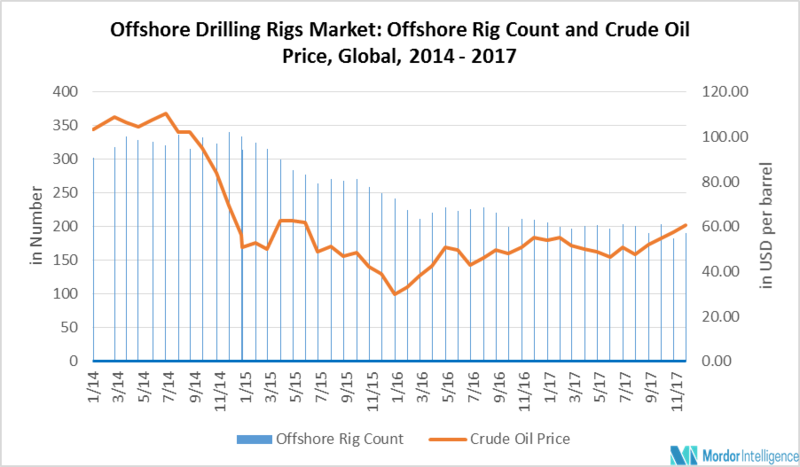 The offshore drilling market is suffering from demand and supply gap, which is too wide to overcome, without an additional impulse. The oversupply had reduced the rig day rates by 50% in 2017 as compared to the 2013-2014 level, and is expected to remain soft in the near future. In 2017, the oversupply was 50% for the offshore drilling fleet globally, including drillships, semisubmersible and jack-ups. Also, rigs sitting in yard become less competitive and the activation costs of new build or old cold stacked rigs increases with increase in idle time. As a result, the lesser revenue for companies and the extra cost for activation of stacked rigs are restraining the market growth. January 2018 - Maersk Drilling has received a four-year contract for deep water drillship from Tullow Ghana Ltd.
December 2017 - Total E&P Norge AS has extended the contract with Maersk Drilling for Jackup rig Maersk Intrepid. December 2017 - Nabors Industries acquired Tesco Corporation, which is an oilfield service company specializing in designing, manufacturing, and servicing of technology based solutions for the upstream oil & gas industry. June 2017 - Ensco acquired Atwood Oceanics, Inc., which is an offshore drilling contractor. MAJOR PLAYERS: Aban Offshore Limited, Diamond Offshore Drilling Inc., Ensco PLC, Maersk Drilling, Nabors Industries Ltd, Transocean Ltd, Seadrill Limited, Pacific Drilling SA, Rowan Companies PLC, and Noble Corporation, among others.